An agreement has been reached on the reform of Frontex, the European Border and Coastguard (EBCG). This week, the co-legislators, the European Parliament and the Council, agreed on a revised version of the proposal launched by the European Commission in September 2018. The latest change follows on from the 2016 revision of Frontex’s mandate which transformed it into the EBCG (although still to be known as Frontex). ECRE’s detailed analysis of the 245-page agreement will follow, however six main changes to Frontex’s mandate are highlighted in this article containing its preliminary analysis. First, as extensively reported, the revision creates a standing corps of operational staff, who will be part of Frontex and deployed by it. 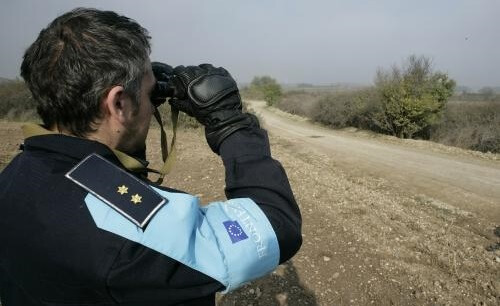 There are four categories of staff mentioned: statutory staff employed directly by Frontex; long-term deployments from the Member States; short-term deployments who will be “ready” to be deployed by Frontex; and reserve staff who will be ready to be “activated” for deployment in a Rapid Reaction Force. The agreement refers to “up to” 10,000 members of the standing corps and Annexes I-IV set out a timeline of eight years to reach the 10,000, with targets per year and per Member State covering the first three categories of staff. The figure of 10,000 is the number of members of the existing European Border Guard Team, which consists of the rapid reaction pool of Border guards (mandatory contributions from Member States for use in crises) and other, voluntary, contributions from Member States. Some Member States objected to the mandatory rather than voluntary nature of deployment of staff to the standing corps, the main difference between the proposal and the status quo; thus, the agreement represents a complex compromise. Extensive funding to cover Member States’ costs are foreseen. Second, the already extensive role of Frontex in return operations is further expanded, however, the controversial reference to a role in the “preparation of return decisions” has been removed and the relevant section emphasises that it will not enter into the merits of return decisions. ECRE raised concerns about the legal ambiguity that the language on “preparation” of decisions introduced, which could have led to problems similar to those generated by legal ambiguities in EASO’s role in practice in decision-making in Greece and proposed to changes to its mandate (yet to be agreed). The provision granting Frontex the power to “launch return interventions in third countries” has been deleted, as strongly recommended by ECRE, given the obvious risks attached to managing return of third country nationals from other third countries: many of the countries where such operations could have taken place have poor human rights records, including the countries of transit for migrants and refugees perceived to be heading to Europe. Third, the agreement nonetheless expands the role of Frontex in third countries, including widening the range of activities that it may carry out in countries that do not border the EU. Consistent with the point above and with ECRE’s recommendations, this will not include return operations, as Article 75(4) covering return under assistance to third countries has been deleted. Cooperation should serve to “promote European Integrated Border Management standards” (Art. 72 (4), a new clause), and “act within the external action policy of the Union, including with regard to the protection of fundamental rights and the principle of non-refoulement”, as per the original proposal. These provisions could serve to limit the scope of Frontex’s external activities, however enforcement and accountability in EU external actions can prove challenging. In another change, Member States will have to consent to the use of their personnel in such activities in third countries. Additionally, Frontex should now ensure that any involvement of third country observers does not “pose any risk related to respect of fundamental rights”. Fourth, the Commission’s original proposal stated that “The Commission shall negotiate the status agreement[s]” for cooperation with third countries. The agreement deletes this wording. Instead, the Commission should draft a “model” status agreement, to include human rights provisions, and in consultation with others including the Fundamental Rights Agency. Arrangements with particular countries will be based on the model agreement and the European Parliament will be informed before their conclusion. While these are welcome safeguards, given the use of ever more informal agreements as the basis of cooperation with third countries on migration, this area is likely to receive close attention from the Parliament and human rights organisations, including those in the third countries concerned. Fifth, the changing role of EUROSUR in collection of data on situations outside the EU (“pre-frontier” data), combined with analysis of risk (defined as risks to the functioning of Schengen) and the reactions required from Member States, suggests the gradual emergence of what the agreement calls “a pre-warning mechanism”, essentially an early warning system to involve mobilisation to intervene when movements of people are detected. These measures are likely to be monitored by those concerned about efforts to further limit access to territory for those seeking protection. Somewhat relatedly, a major change compared to the proposal is that urgent action at the external borders (such as deployment of the standing corps or rapid reaction force) when the Member State in question is not taking “necessary” measures, now requires a decision of the Council. The Commission’s proposal envisaged it using implementing acts to take forward urgent actions in consultation with Frontex. Throughout the agreement, other additions strengthen the decision-making role of the Council and the need for consent of the individual Member States where actions are to take place, while strengthening the role of Frontex in assessing and supporting Member States. Sixth, the agreement strengthens the internal fundamental rights capacity of Frontex, including the creation of a deputy fundamental rights officer position to assist the fundamental rights officer (FRO), fundamental rights monitors, additional roles for fundament rights staff in different aspects of Fontex’s work, and a code of conduct. Language aimed at safeguarding the independence of the FRO, including reporting structures and powers to recruit staff, and at ensuring “sufficient and adequate human and financial resources” is also included. The complaints mechanism established by the 2016 Regulation is further strengthened, including through the inclusion of responsibility for omissions as well as actions, and through follow-up required of Member States when their personnel are subject to complaints. That said, the full gamut of revisions proposed by ECRE and others have not been incorporated into the agreement. This, combined by the rapid increase in size and changing nature of Frontex, means questions remain as to whether the mechanisms are proportionate to the task of preventing, identifying and remedying potential human rights violations. Finally, other developments include the deletion of references to controlled centres and articles that will open the door for involvement of the UK, post-Brexit, a priority for the UK government, given its previous support from Frontex return operations. ECRE’s detailed analysis of the agreement, its implications and next steps will follow.